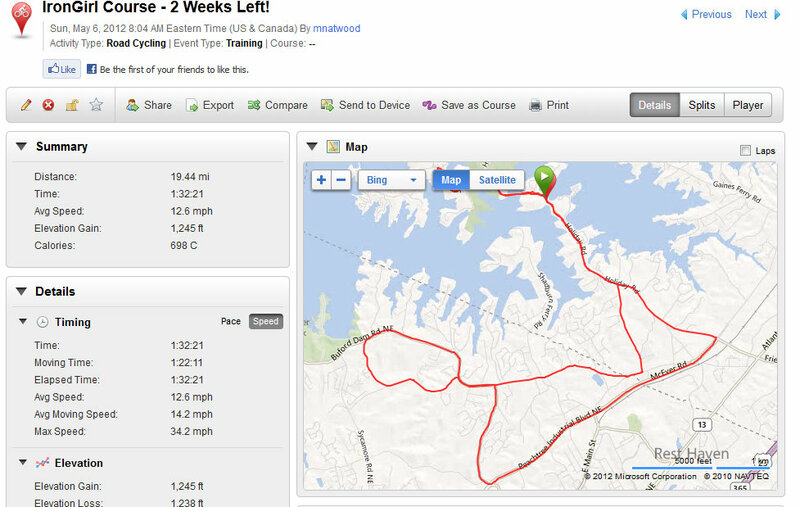 Went back to ride the Iron Girl Atlanta bike course today with my pal, Karen. My spin buddy, Mark, came along, as well as new friends Charity, Cynthia and Joanna. I met Charity a few days ago through this blog, and she brought Cynthia. Turns out that Karen and Charity knew each other, and Joanna is good friends with Karen. Small world! We had a great ride. The horrific hills from less weekend, seemed quite a bit less horrific this time. 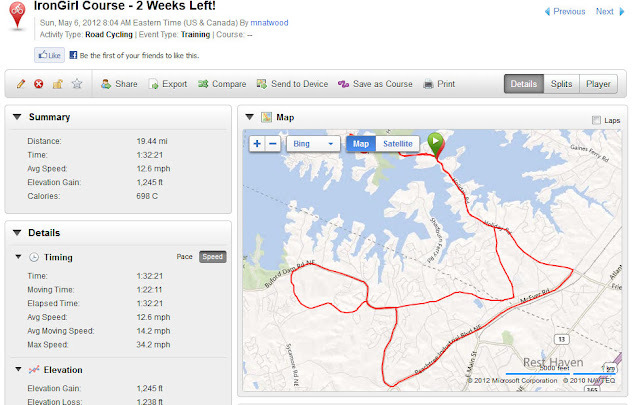 While Mark is not doing Iron Girl (of course), he is doing his first triathlon in June at Lake Lanier. Too bad Mark and I look like we could be siblings. Even though I was bringing up the rear most (all) of the ride, I had eaten well on Saturday and consequently woke up down another pound and feeling better. After the ride, Joanna and I went to Mary Alice Park for a quick little open water swim. The water was a great temperature – cool to start, and therefore, no wetsuit for me – I was nice and warmed by the end. 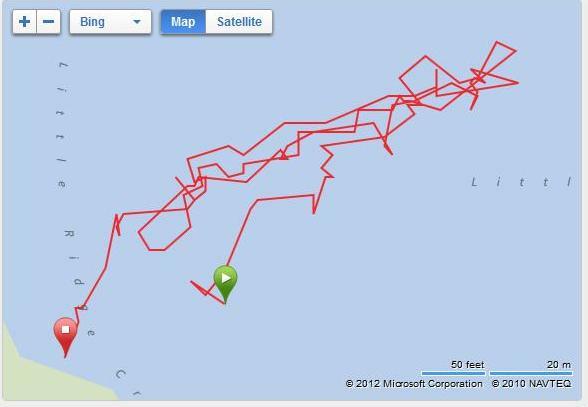 Garmin maps of swims are my FAVORITES. The satellite signal pinging all over the place looks like we were swimming on crack. So I’m still eating mostly vegetarian, but I am (right now) focusing on not dying and bingeing… so fish has been a part of the diet over the last few days. Lunch today? Oh no… . Not too shabby! Picked off the cheese. Tomorrow is a new day! So many of you are starting new on your commitments. Thanks for all the amazing encouragement, comments and emails. We can do it! Fun pool time yesterday with Swim Bike Kid #1. You know … you look really great in all these photos! Please pass on your eating tips! I really want to lose before my competition … I know it will help with the run part. 7 miles is freaking me out. Especially after yesterday's sprint practice. YUCK! I stunk. It was great meeting you yesterday! Your blog is awesome and very inspiring. See you at Irongirl!